According to the University of Illinois, 90 percent of the pumpkins grown in the United States are raised within a 90-mile radius of Peoria, Illinois. 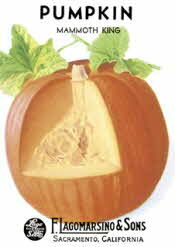 Total production of pumpkins by major pumpkin-producing states in 2009 was 931 million pounds. Illinois led the country by producing 429 million pounds of the vined orange gourd. California and Ohio were also major pumpkin-producing states: each produced at least 100 million pounds. An average pumpkin weighs 10-20 pounds, though some varieties can weigh 600-800 pounds, and recording breaking pumpkins approach 2,000 lbs. Total U.S. pumpkin production in 2007 was 1.1 billion pounds. Illinois led the country by producing 542 million pounds of the vined orange gourd. Pumpkin patches in Ohio, California and New York also provided lots of pumpkins: Each state produced at least 100 million pounds. 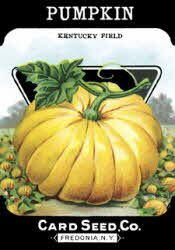 New Hampshire designated the Pumpkin (Cucurbita mixta) as its Official State Fruit in 2006. The value of all pumpkins produced by major pumpkin-producing states was $117 million. One of the first published recipes for pumpkin pie (Pompkin Pudding) was in Amelia Simmons’ 1796 cookbook, ‘American Cookery’. This the first cookbook to be written by an American and published in the United States. The winner of the 2003 biggest pumpkin contest weighed 1,140 pounds. When Howard Dill of Ontario, Canada, known as the Pumpkin King, sent one of his championship pumpkins to the U.S. for a competition, customs officials called drug agents, not believing that there could be a 616 pound pumpkin in the crate. Championship pumpkins today are over 1000 pounds. These pumpkins grow 10 to 15 pounds or more per day!